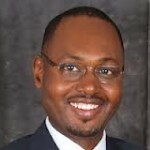 Amadou Mahtar Ba is a seasoned professional with wide Africa & US experience in media, governance, technology and innovation. He is Co-Founder and Executive Chairman of AllAfrica Global Media, Inc. AllAfrica owns and operates http://allafrica.com, an international multi-media content service provider, systems technology developer and the largest distributor of African news and information worldwide. Till May 2014, he was Chief Executive of the African Media Initiative (AMI), a pan-African effort he established to provide the continent’s media owners and practitioners with the tools they need to play a stronger leadership role in their communities, countries and the region. AMI is strengthening Africa’s media sector to ensure the accountability of governments and other institutions while promoting democratic governance, human development as well as economic growth and transformation. Prior to starting AllAfrica in 2000, Mr. Ba served from 1996 to 2000 as Director of Communications and Marketing for BICIS Bank, a subsidiary of the French banking group BNP Paribas. From 1993 to 1996, Mr. Ba helped lead the successful restructuring and privatization of the Panafrican News Agency (PANA). He sits on several boards and participates in a number of international working groups including the World Economic Forum Network of Global Agenda Councils, the Africa Democratic Institute, the Africa Policy Advisory Board of ONE, the African Digital Advisory Board of SANOFI and serves as a member of the Panel of Judges for the CNN African Journalist Award. In 2008, he convened the African Media Leaders Forum (AMLF) for the first time with support from the World Bank Group, the Coca Cola Company and Ecobank. AMLF has become the largest annual gathering of African media owners and operators, bringing together 655 participants in Addis Ababa in 2013. African Heads of State, leaders of continental organizations such as African Development Bank, African Union, Nepad and UNECA, join the media to advance dialogue and innovation at AMLF. Mr. Ba was educated in Senegal, France and Spain. He is fluent in French, English, Spanish, Fulani and Wolof. He holds a Masters degree from the Ecole Française des Professionnels de la Communication in Paris and a Bachelors Degree in Foreign languages and International Relations from the Paris 7 University (Jussieu).